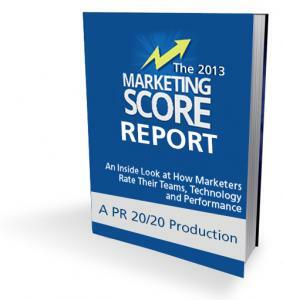 In December 2012, we released PR 20/20's Marketing Score assessment tool into public beta. Since that time, nearly 700 marketers and executives have registered for free to evaluate their organizations, and we're starting to learn some fascinating things. 81% identify "generate leads" as a high-priority goal. 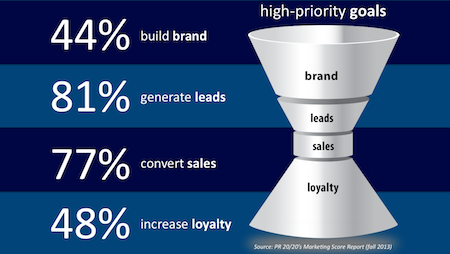 77% identify "convert leads into sales" as a high-priority goal. 59% of organizations have aggressive (>20%) or moderately aggressive (15-20%) growth goals. 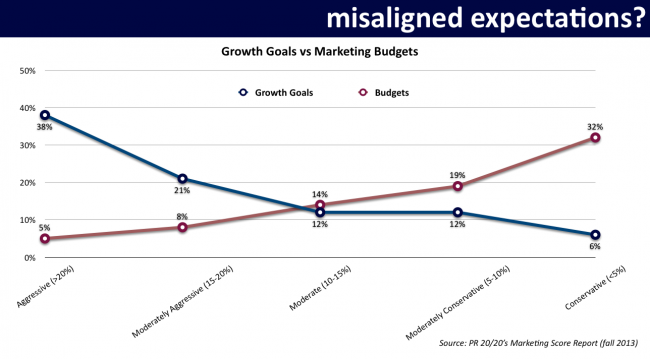 51% of organizations have conservative (<5% of revenue) or moderately conservative (5-10% of revenue) marketing budgets. The average overall Marketing Score is 42%. The 3 highest rated sections are Business Cores (63%), Marketing Cores (56%) and Audiences (50%). The 3 lowest rated sections are Lead Sources (32%), Public Relations (29%) and Content Marketing (25%). Organizations with 11-15 marketing employees overall Marketing Score is 33% above average. B2B organizations score 13% higher on average than B2C organizations. 53% of organizations do NOT utilize call tracking, 26% do NOT utilize marketing automation and 18% do NOT utilize CRM. But, interesting data points are only the beginning of the story. Marketing Score is constructed to evolve into a marketing intelligence engine that will recommend actions to improve your marketing performance. The assessment includes 27 profile fields, along with 132 factors across 10 sections. By connecting member factor ratings to their profiles, and benchmarking against other members, we'll be able to automatically generate recommendations customized to your organization by life cycle, revenue and marketing goals, employee size, marketing budget, industry, sales cycle length, and more. These recommendations will help organizations devise integrated marketing strategies; select the right marketing agency partners; allocate time, money and talent; and adapt resources and priorities based on performance. While the marketing intelligence engine, Assist™, is still in development (however, you can request a personalized Marketing Score Brief strategy session), we're going to start sharing what we're learning. This fall, PR 20/20 will publish the inaugural Marketing Score Report based on more than 300 in-depth marketing assessments. You'll gain unparalleled insight into how marketers and executives rate their organizations across 132 factors in 10 sections: Business Cores, Audiences, Marketing Performance, Marketing Cores, Lead Sources, Marketing Team Strength, Marketing Technology Utilization, Social Media Marketing, Content Marketing and Public Relations. Does your organization have the right marketing talent, technology and strategy to achieve its growth goals? 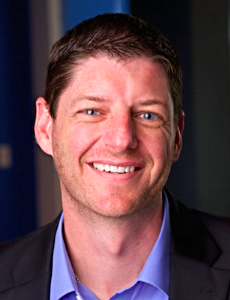 Do you have the right agency partners? Are your resources aligned with priority funnel goals? What are the opportunities for underdogs and innovators that don't have the budgets and teams of their larger competitors? Register today to be among the first to download the free Report when it's published in September. We'll email you as soon as it's available. In the meantime, sign up free for Marketing Score, and discover the gaps in your talent, technology and strategy that are impacting performance.